It's a long rain jacket, is what a cagoule is, to answer what is likely the first question any American has about this record. The second question is probably something along the lines of "Benjamin who?" Even so, longtime Clicky Clicky readers will recall Benjamin Shaw's sublime 2011 set There's Always Hope, There's Always Cabernet [preview], and perhaps other of his releases. Mr. Shaw, simply put, is among the best London has to offer, a songwriter both morose and sly, a man whose ghoulish songs are stunning, detailed tableaus of rich absurdity, beautiful putrefaction and boundless despair. 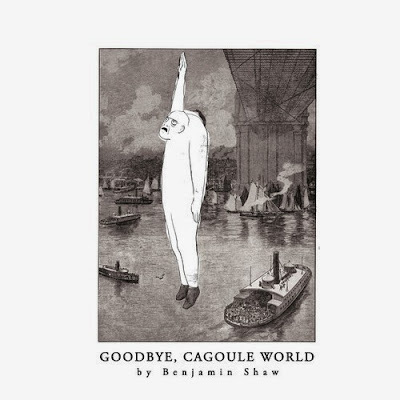 While it is not sonically as of-a-piece as the aforementioned Cabernet or the fantastic 2013 instrumental set Summer In The Box Room, Shaw's latest long-player Goodbye, Cagoule World is nonetheless a marvel, illustrating both the breadth and depth of the talents of this underlooked fun trick noisemaker. The record features Shaw's characteristic, charmingly dour reportage on slow doom and slower decay, around which he has arranged into an immersive aural collage a surprising and rich array of exquisitely crafted sounds. There's the lonely vibrato guitar leads quietly hammering themselves in the head, and the demented and aimless saxophone, in "Always With The Drama." The mid-tempo, canned swing of "Break The Kettles And Sink The Boats" hints only slightly at the shuddering boxed rhythm that opens the instrumental "A Day In The Park." But as good as Shaw's instrumentions sound, it is his incisive and decimating lyrics that resonate most powerfully. After a protracted, spectral introduction, the album opener "No One" presents a vivid, indeterminate and potentially terrifying narrative with only a single lyric: "No one can love you like I do, 'cause you never, no you never, leave the flat." Is this a description of a quiet, prim relationship? The quiet taunt of captor to captive? Whatever is happening in the song, it has taken the last great single-lined song -- Built To Spill's towering (and apparently rarely performed) "You Are" from 2001's Ancient Melodies Of The Future -- and bent it tantalizingly toward Shaw's "Endgame"-esque aesthetic. This is not to undersell Shaw's penetrating wit (we'll leave it to Audio Antihero to do the underselling -- OOOH BURN! -- Ed.). As beautiful and human as the aforementioned moments are, the easy lilt and sardonic lyrics of the booby-trapped "You And Me" make it the closest thing to a pop hit among the songs of Goodbye, Cagoule World -- while, of course and in true Shaw fashion, aiming to torpedo pop convention. Over a serene epilogue, a bed of wavering synth tones that recalls the bed of Hypo's microhouse anthem "Nice Day," Shaw bullet-points the makings of a lamestream lyric: "so here's a line about the system, and here's a line that's quite funny, and here's a pop culture reference, and a lazy refrain, like 'you and me.'" Shaw's distinctly smart and singular voice -- whipsmart and deeply affecting, and we're using "voice" in the figurative sense here -- puts him in the rarified company of non-hitmakers of the day including Krill's Jonah Furman or Los Campesinos!' Gareth Paisey. Goodbye, Cagoule World will be released as a compact disc and digital download by the aforementioned, venerable mess of a label Audio Antihero April 21. The first 100 pre-orders of either format will also receive a Benjamin Shaw-endorsed stress ball, if they click the correct button on the Bandcamp page here. A stress ball seems rather ridiculous given the transcendent futility consistently portrayed in Shaw's music -- so wait, maybe it's perfect, actually. 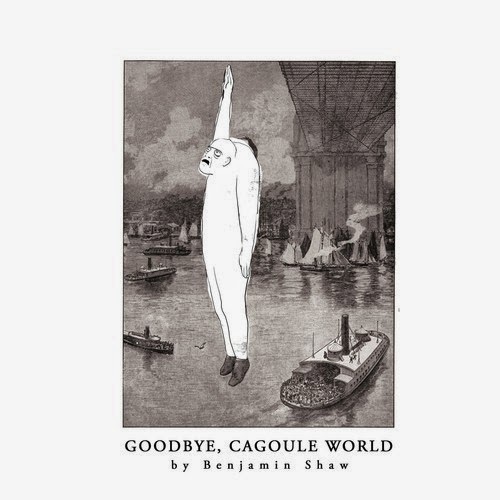 The release of Goodbye, Cagoule World will be feted at a show April 29 at Servant Jazz Quarters in London, but if you'd prefer not to wait as long as all that, Shaw will also appear Wednesday at London's Ivy House. For the time being, the entirety of Goodbye, Cagoule World can be stream right here at GoldFlake Paint. We've also embedded the title track and "You And Me" for your listening pleasure below.